Custom Magnifier Rulers Personalized in Bulk. Promotional, Inexpensive. Lowest prices in the USA and Canada. We supply bulk personalized magnifier rulers and blank wholesale magnifier rulers in clear or translucent colors. Our 6 in. long transparent magnifier rulers with line enlarging lens are ideal for school, office and college. Free artwork design. We will send you a proof for your approval before going into production. Budget Prices in the USA and Canada for wholesale personalized magnifier rulers. American clients pay no taxes. You may imprint in 1 color or full color (unlimited number of imprint colors): see the Price Table below. Unit prices below include your 1-color custom imprint. 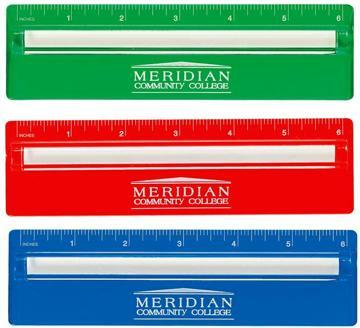 Full color Imprint: add $0.20 per ruler. Blank (not custom imprinted) magnifier rulers cost $0.50 each (minimum 250). Imprint Area: 3" x 5/8" . White imprint is recommended on colored magnifier rulers. Packaging: Bulk. Add $0.14 per unit for individual packaging in plastic sleeve.